If you follow me on Instagram @gwenstellamade, you would have seen several photos of my adventures in Vietnam a few weeks ago. Yes, my boyfriend and I went on a 9-day trip to Vietnam and it was such a good trip! One of the best things about being a Singaporean and living in Singapore is the ability to travel southeast Asian countries easily and quickly. Most destinations are just a few hours away on the plane and there is no need for a visa. There are so many things we did and ate on the trip, here’s just a selection of some of the memorable moments I managed to capture in photo. These retro floor tiles caught my eye while my boyfriend was getting his feet measured for a pair of custom-made leather shoes. He got a pair of simple brown shoes made to measure for USD50. It’s no surprise that I found my way into a teahouse while on a holiday. This teahouse hired people with hearing impairment and the entire teahouse is a sanctuary for people who want to get away from the busy market streets just for a while. Did I forget to mention that this trip was also part of my birthday celebration? My boyfriend booked a sunset dinner cruise with Cinnamon Cruises in Hoi An for my birthday dinner. We were lucky because there happened to be NO ONE ELSE on the same boat with us. And then boom! We were in Hanoi and there was a street with every single store selling craft supplies like zippers and beads! As you can see, I was a very happy girl. In Hanoi, our search for the best banh mi (aka Vietnamese cold cut sandwich) began. It wasn’t this streetside stall. Get your best cold cut traditional banh mi for just 1USD at Banh My Ba Dan on 34 Lò Sū. These fried Hanoi spring rolls were so tasty and easy to make! I can’t wait to try the recipe we learnt in our cooking class now that we’re back home. And because we got weary of the busy streets of Hanoi, we also spent a day in Tam Coc. 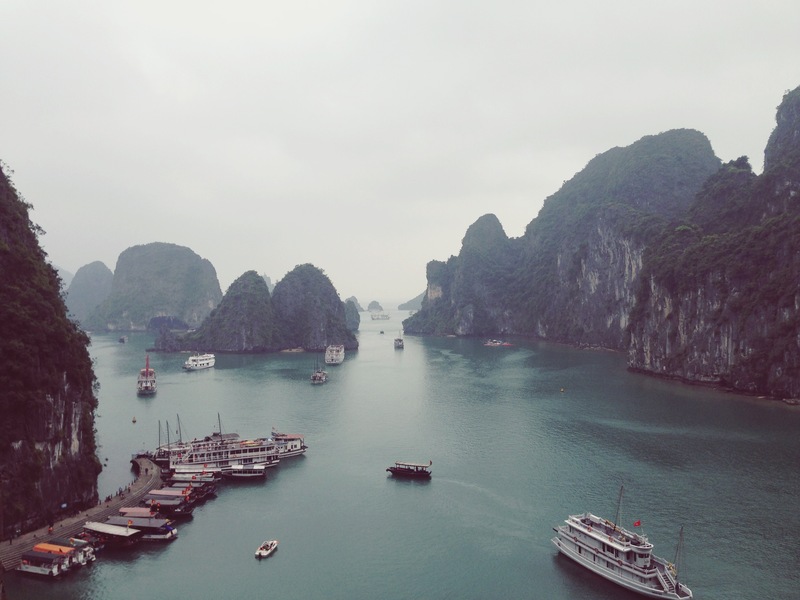 The tour guide described it as touring Ha Long Bay on land. He was wrong. 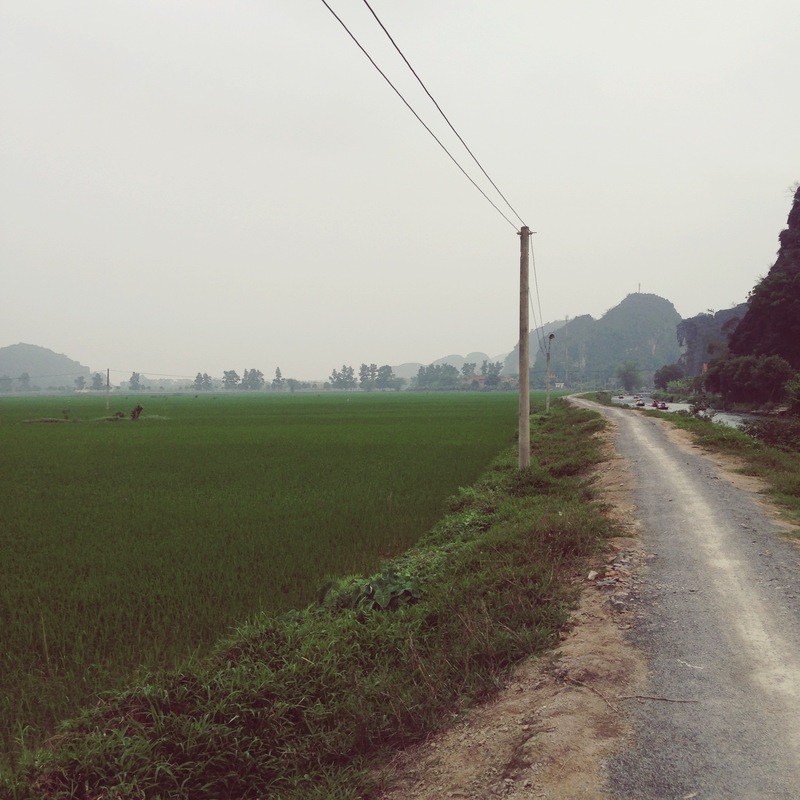 We travelled around the rice fields and countryside with Ha Long Bay in the background.. on rickety bicycles. And of course, we travelled to Ha Long Bay by boat to see the UNESCO World Heritage site up-close and personal. We travelled and stayed overnight with ANNAM JUNK which kept us well-fed with 8 – 9 course meals. I will never forget the experience of kayaking along one of these limestone beauties. Last but not least, this coconut coffee smoothie has got me hooked! I have never been a coffee drinker, but this little devil has got me wanting more. Does anyone have any good coconut coffee smoothie recipe to share? And there you go, that’s my little adventure in Vietnam. Have you travelled to Vietnam? What was your most memorable experience?